In this article, I look at whether the Green Party can realistically expect to elect more than one MPs, in particular in Victoria. Week two and we finally, finally have our first true, complete poll. This is from Ipsos and you can find the details at the end of this article. As a reminder, until now, we've had one Forum poll done on a Sunday between 10am and 4pm, another Forum for the GTA-only done on a Friday during the same hours, and one Mainstreet poll for BC only. We also got a Nanos, but they do a weird 4-week average which makes the numbers pretty much useless. So it's nice to finally have a Canada-wide poll, done over multiple days. The fact we have less polls during this campaign than we did before the writs were dropped is puzzling, but let's move on. The new Ipsos numbers show a close three-way race with a slight edge for NDP, at least in terms of votes. At 33%, the NDP has a 2 points lead over the incumbent Conservatives, and a 5 points gap ahead of the Liberals.While it might not look like it at first sight, Justin Trudeau and his party are actually the ones making gains. Indeed, compared to the most recent Ipsos poll, they are up 3 points while the NDP and Tories are both down. Given the sample sizes, this is actually a significant change. Moreover, this poll seems to confirm a small trend observed before where the Liberals appear to be slowly rising. It's way too early to tell, but here are the evidence so far. The above mentioned GTA-only poll had the Liberals slightly higher than expected. Sure, this poll had serious limitations, but we can't completely discard it. Using the Mainstreet numbers, we get the Liberals at 27% in BC (among people who watched the debate though), higher than the previous poll average and 8 points higher than in the previous poll from the same firm. On top of this, we now have had three polls with information regarding the Maclean's debate and the performance of each leader. In all three, Justin Trudeau is seen as the winner by most. The table below shows my usual "debate index" where I divide the % of people picking one candidate as the winner by the % of people who want to vote for this party. Therefore, a score above 1 means the leader managed to convince people outside of his party support while a score below 1 indicates the opposite. The idea of the index is to remove the bias caused by the fact that a lot of voters will see "their" leader as having done the best (i.e: trying to remove some subjectivity). It's also there to see which leader might have done the most in order to convince other voters to switch party. As you can see, Elizabeth May is clearly the "winner" using this measure. She's by far the leader who managed to reach outside of her party base. Of course, this index is usually quite favorable to small parties as they can't really do worse (plus, let's face it, a lot of people might judge the leader of a small party differently. For instance because she doesn't "have" to look like a Prime Minister). Nevertheless, May can be very satisfied with her performance. 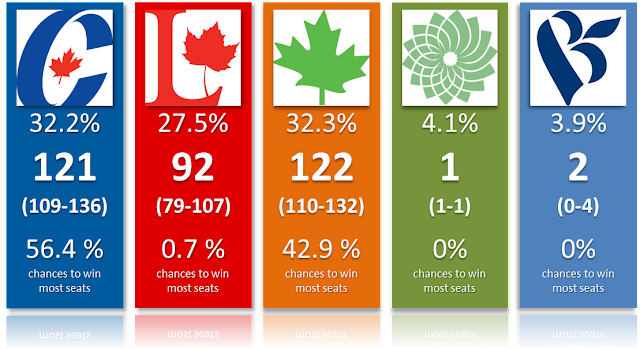 But among the main three parties, Trudeau is the closest to 1 while Mulcair is the furthest in average. We aren't talking about a debate performance with a knockout or anything, but Trudeau seems to have done at least relatively better than his two direct opponents. Even if you don't like my index, Trudeau was chosen as having had the best performance by the most voters in all three polls. What I'm trying to say here is that so far, there hasn't really been any bad news for the Liberals. While the polls were not Trudeau's friends this summer, the Liberal leader seems to have at least stopped the decline. The only negative was that the LPC was technically down this week in the Nanos poll, but the sample size is so small that it's hard to really take anything from it. Of course, being (slightly) up is good, but the Liberals were starting third with virtually no chance of winning the most seats. So they had a long way to go. Let's see the projections we would get using the latest Ipsos numbers (given the lack of polls, we might as well use this survey only. No need for a poll tracker when there aren't any poll). Voting intentions; Seat projections with 95% confidence intervals; Chances to win the most seats. First thing first, yes, the Conservatives have more chances to win the most seats despite being projected with less wins. 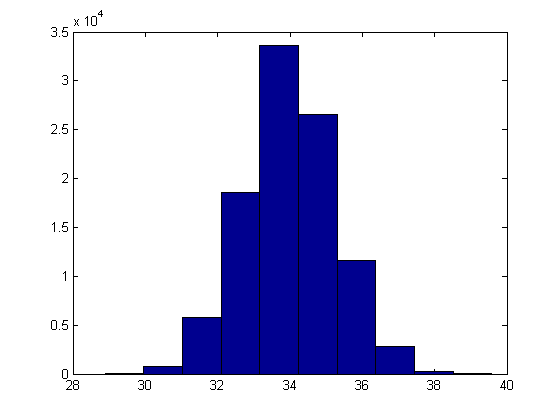 This can happen because the distributions of seats are not symmetric. In other words, the average of the projections is not the same as the projections of the average voting intentions. If you prefer, just interpret this as if the polls are slightly wrong (like underestimating the CPC), then the total number of seats of this party could increase quickly. On the other hand, the NDP wouldn't gain as much of an small underestimation. Also, and this is important, in case of a tie between the two parties, the model gives the win to the incumbent Stephen Harper (as is the rule of our system, at least in theory). If we look into the 5000 simulations, we actually find 2662 cases where the Conservatives win the most seats, the exact same number of scenarios where it's the NDP, and 171 cases where it's a tie. At the end of the day though, don't read too much into this. The situation with this poll is that it's a close race between Tories and New Democrats with the Liberals far behind. Also, you may have noticed the percentages for the voting intentions are slightly different from the published Ipsos poll. This is because I allocate undecided differently. I give more of them to the CPC because the incumbent is often underestimated (and small parties receive none). It's not a major change but it's enough to make a small difference. If you don't think we should do that and you trust the polls (or you really distrust them), remember you can always use your own numbers in the simulator. But speaking of the Grits, they are at least back to a situation where it's possible for them to win. That wasn't the case at the beginning of this campaign. It's still a long shot, but it's better than nothing. It does show that Trudeau and his party are having a relatively good start of a campaign. Had it been otherwise (as well as win by Mulcair at the debate), the Liberals were at risk of becoming irrelevant very early on in this election. In conclusion, nothing major has happened so far in this campaign. But if we had to pick one party/leader with a better start, it seems that would be Justin Trudeau and the Liberals. We are far from a come back or surprise win, but the slow and continuous decline observed in the recent months seems to have been stopped and even inverted. We'll hopefully get more polls soon to see if there is really a trend. Ipsos poll for Global News. Conducted between August 7th and 10th among 2022 respondents from the Ipsos online sample. Margins of error for a probabilistic sample of this size would be 2.03% 19 times out of 20 for the NDP and less for the other parties. The question asked was: "Thinking of how you feel right now, if a federal election were held tomorrow, which of the following parties' candidates would you, yourself, be more likely to support?". More details available here. One day after the debate, we have (finally) a new poll from Forum. Although this one was only conducted in the GTA. Still, given this is one of the most important regions in term of seats (be honest, how many times have you heard this election will be decided in the GTA? ), it is actually quite useful. And the sample size is perfectly decent at 1016 respondents. However, as it was the case with the previous poll from Forum, this one was conducted between 10am and 3PM today! It's obviously a serious limitation as it means that "normal" people who go to work from 9 to 5 were harder to reach. You can find all the details of this poll at the bottom of this post, complying with Election Canada's guidelines. With this limitation behind us, let's take a look at the poll. The Liberals are first in the GTA with 37% of the vote. The Conservatives are second at 31% and the NDP is third with 28%. How does this compare to 2011 and the recent polls? Compared to the last general election, this is a drop of around 10 points for the Tories (who, if you remember, probably created the biggest surprise by winning some seats not only in the suburb of Toronto, but also in the city itself). The Liberals are up about 5 points, so is the NDP. Is this poll different from other recent ones? Well, most polls don't include a breakdown for the GTA only since the sample size isn't big enough for it. However, if I look at the projections based on the recent polls, I had the Liberals at 34% in the GTA, the CPC at 32% and the NDP at 31%. This is well within the margins of error then. It does seem though that I was slightly overestimating the NDP but it's most likely due to the previous Forum poll that had this party really high. Overall, I'd say this new poll is in line with what we would expect to see in the GTA. How bad would it hurt Stephen Harper in term of seats? My model doesn't specifically use the number for the GTA. Instead, it uses provincial ones and adjust them using regional coefficients. As mentioned above, the percentages in the GTA by doing that are quite close to what Forum is showing in this poll. Looking at the projections, we see that Prime Minister could see his 40 seats from 2011 cut by half, while the Liberals would move from 10 to 26 and the NDP would gain 4 seats. If we remember this party was slightly too high in my projections, it means the gain in this region for Thomas Mulcair could be very limited. I mentioned before how Ontario isn't the best potential source of seats for this party. In conclusion, this poll in the GTA shows results that are to be expected. The Liberals are slightly higher (and NDP slightly lower) but it remains to be seen if this is indicative of a bigger trend (are the Grits up in Ontario?) or if it was just this poll. What it also shows is that the GTA is indeed a battleground with all three parties being competitive, although the NDP would have a hard time winning the most seats there. For Justin Trudeau, it must be nice to finally have one poll showing some good news. By the way, this poll also included a question regarding the debate of last night. I'm covering this in my other post. Data collected on: August 7th, between 10am and 4pm. Question asked: "A federal election has been called for October 19. Which party are you most likely to vote for in this election?" followed by "Even though you may not have made up your mind, which party are you leaning towards at this time?" 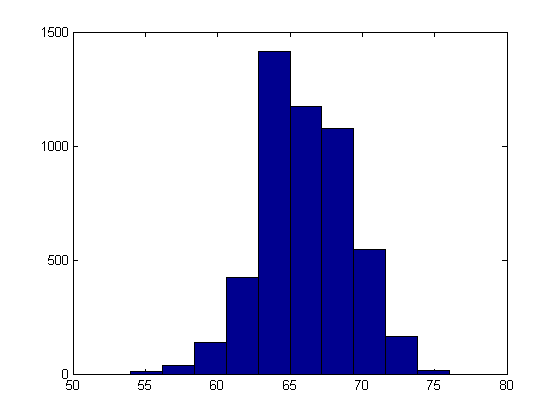 Population sampled: citizen aged 18+ in the GTA. Margins of error: + or - 2.97% for the Liberals, less for the other parties, 19 times out of 20.